A five-year, $10M clinical investigation named Wisconsin Smokers’ Health Study 2 (WSHS 2) conducted by members of the University of Wisconsin Center for Tobacco Research and Intervention (UW-CTRI) and the UW Atherosclerosis Imaging Research Program (UW AIRP) was designed to help patients quit smoking and assess whether artery damage caused by smoking could be undone. 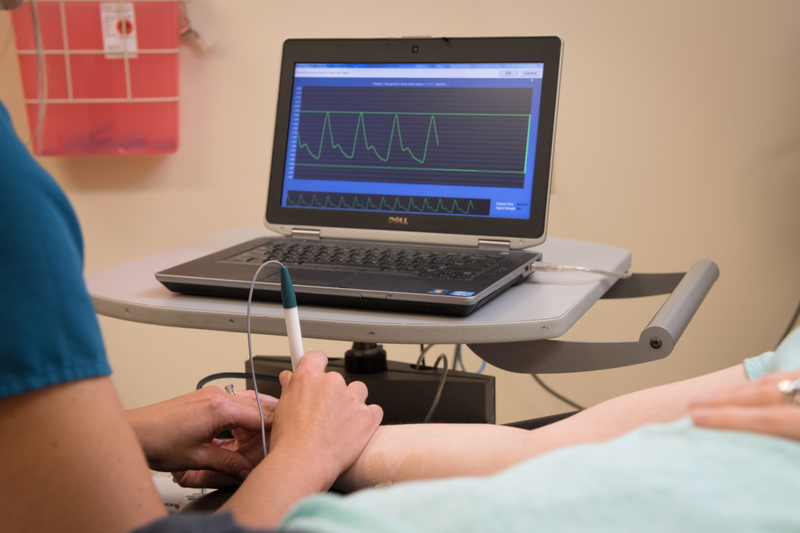 Part of the study involved radial artery tonometry on 1,086 current and former smokers. Findings indicate that smoking cessation can reverse arterial stiffening and pressure augmentation. “Compared to people who continued smoking, the arteries of people who quit as part of the Wisconsin Smokers’ Health Study were much less stiff, which lowered their risk of heart attacks and strokes,” said James Stein, MD, Robert Turell Professor in Cardiovascular Research and director of the UW AIPR. Dr. Stein is a principal investigator of the study. Smoking cessation is associated with reduced likelihood of cardiovascular disease events, however the exact mechanisms are unclear and continue to be investigated. Now, researchers have discovered that arterial stiffening is a key factor and that damage to arteries is reversible. Researchers also collected blood and urine samples and analyzed them for markers of oxidation and inflammation. Certain markers such as white blood cell count, myeloperoxidase and urinary isoprostanes increased with heavier smoking, and decreased upon cessation; a research article detailing these findings is currently in press. Of the 1,086 smokers enrolled in WSHS 2, about 25 percent had quit smoking after 6 months. A year after their quit day, about 20 percent of smokers were not smoking—a cessation rate four-fold higher than the 5 percent success rate of quitting that has been reported in absence of combination nicotine-replacement therapy. Previously, a separate UW-CTRI study had concluded that offering extended coaching via the Wisconsin Tobacco Quit Line plus combination nicotine-replacement therapy helped 50% of patients to quit smoking, an unprecedented rate. WSHS-2 patients answered automated calls on or around their quit day. UW-CTRI researchers found those who used either varenicline or nicotine patches in combination with lozenges felt better after quitting than those who used only patches, and weren’t as overwhelmed by cravings. Staff from the UW-Madison Atherosclerosis Imaging Research Program (from left): Dr. Carol Mitchell, exercise physiologist Laura Zeller, senior sonographer and study coordinator JoAnne Weber, exercise physiologist Jean Einerson, UW Health Preventive Cardiology director Dr. James Stein, associate lab manager Kristen Hansen, senior research scientist and AIRP manager Dr. Claudia Korcarz.